The 1.83 GHz model had an Intel Mobile Core 2 Duo T5600 CPU with 2 MB of L2 cache, used the Intel Intel GMA950 graphics chipset, had a 24x/24x/16x/8x CD-RW/DVD-ROM "Combo" drive, did not include Bluetooth, and supported a maximum of 2GB of RAM. Though reported as a 64 MB graphics system, the chipset actually used a minimum of 80 MB of RAM, resulting in a maximum of 432 MB of RAM available for system use in the base system. The 20" model had the following dimensions and weight: 18.6" H x 19.4" W x 7.4 D, 22 lbs. The 24" model used an NVIDIA GeForce 7300GT graphics card with 128 MB of VRAM (a 256MB NVIDIA GeForce 7600 GT was available as a BTO option), and had one FireWire 400 and one FireWire 800 port. It had the following dimensions and weight: 20.6" H x 22.6" W x 8.1 D, 24.7 lbs. Announced in September 2006, the iMac (Late 2006) unified the iMac (Early 2006) and iMac (Mid 2006) lines in to a single product line, upgrading the processor of all models to Intel Core 2 Duo and adding a 24" high-end model in the process. The iMac (Late 2006) was available in 4 configurations. The low-end 17" 1.83 GHz model, previously available only to the education market, had a less expensive graphics chipset, no onboard Bluetooth, 512 MB of RAM and a 160 GB hard drive, and sold for $999. The 17" 2.0 GHz added a faster ATI Radeon X1600 graphics card, 1 GB of RAM, Bluetooth, an Apple Remote, and a SuperDrive for $1,199. The 2.16 GHz 20" model added a larger screen and included a 250 GB hard drive, for $1,499. Finally, a new 2.16 GHz 24" model included a faster NVIDIA GeForce 7300GT graphics card and a FireWire 800 port for $1,999. All models included an integrated iSight camera, and BTO configurations allowed processors as fast as 2.33 GHz. 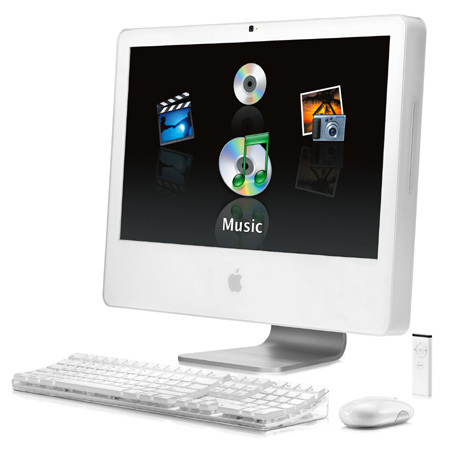 All models were replaced in August 2007 with the release of the iMac (Mid 2007).